It’s glorious sunshine outside, with temperatures above 20°C. It’s a beautiful evening for a ride, but I booked the tickets to this a month ago, I’d better go and sit in a dark theatre. Ventoux by 2 Magpies Theatre, a play about stage 12 of the Tour de France in the year 2000. Where Marco Pantani comes back to cycling to challenge Armstrong after Armstrong’s first Tour de France win, a win that many thought was a fluke; a fluke because there were no previous grand tour winners to compete against. The play has only two characters, Armstrong and Pantani. The stage is two bikes (on turbo trainers) and a few props in front of a large video screen. 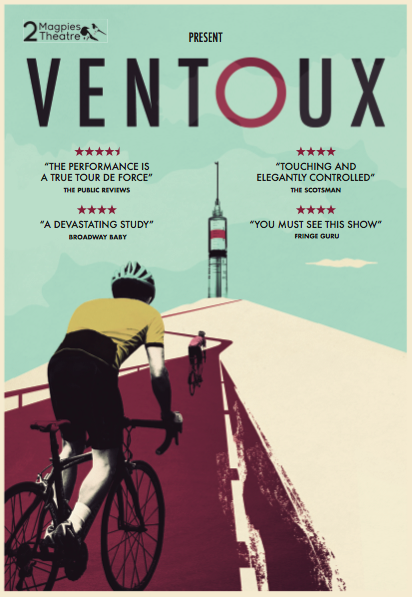 Audio commentary from the actual stage attempts to evoke the tension and drama of the race, whilst the characters jump between the race up Mont Ventoux and their past and future. Despite both actors being dressed in black, the yellow socks and towel quite obviously indicate Armstrong over the pink of Pantani. Though I would have liked to have seen a bit more attention to detail. Perhaps a Trek and a Bianchi would have made more sense than two Cannondales? Perhaps I’m being a bit picky, but if we’re talking about detail, there wasn’t even an attempt at an accent; just two well spoken English accents. The only real attempt to mimic the characters at all was the classic Pantani descending position and a pink towel around his head as a bandana. So if it was looking to capture the characters and personalities of the riders, it failed. I can see what they were trying to achieve; capturing two iconic cyclists at their peak, head to head on one iconic stage. Two legends (or villains) of the sport who’s lives went in such different directions, it sounds like a great concept for a play. But for me, much like a ride on a turbo trainer, it failed to evoke the same feelings as the real thing. I really wanted to like it, but I already know the story, so the statement of events held no drama or mystery for me. Entertaining enough for a rainy day, but I would have preferred to have spent my evening cycling in the sunshine. If it is raining where you are then you can go and see it at a theatre near you, details can be found here.